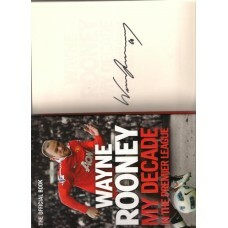 Wayne Rooney Book. This is a fabulous brand new, never read, still wrapped (the photo is of my book) SIGNED copy of the Wayne Rooney Manchester United footballer hard-backed book “My Decade in the Premier League. This will be a fabulous Christmas/birthday present. £59.99 plus postage - which is £4.80 1st class signed for. UK only.